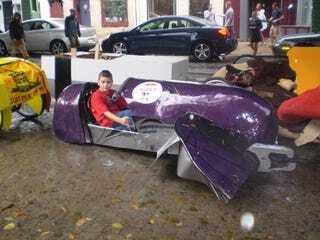 Reader Adam sends word that there was a "extremely accurate" Covenant Ghost soapbox among the 34 registered teams and soapbox cars that took part in the 2008 Red Bull Soapbox Derby in Manayunk, Pennsylvania yesterday. The Spartan Ghosts wore army fatigues on their maiden voyage down the steepest hill in Manayunk in their SoapGhost. Unfortunately, things did not go well. I'll let Adam tell it from his first-hand account:"The members of the team adorned army fatigues and set out to blaze down the steepest hill in Manayunk in the eerily detailed Ghost. They set out to do that, at least, but it's very apparent that they neglected to hold the "L-trigger" and boost the vessel down because the ship went virtually nowhere before veering into the haystacks lining the track and coming to a complete halt. To all of our dismay, the ship wouldn't levitate past us through to the finish line, 500m from the pit. It was carried. Well, pushed. Let it be noted, too, that after crashing, the Ghost displayed no secondary explosion and if Halo has taught me anything it's that the damned thing was still drivable. Oh, well. Here's some evidence of the impressive model, anyway. I hope you appreciate it as much as I did!" I know I did Adam, thanks for the fancy write up and fancier pics.